Conor McGregor says he will not vacate his UFC featherweight title if he moves up to fight for the lightweight title. The Irishman, 27, stunned champion Jose Aldo on Saturday night with a 13-second win, the fastest ever knockout in a UFC title fight. "If I go up to that lightweight division, there's no way in hell I'm vacating my belt," he said. "There'll be a belt on both shoulders. The belts will still be active because I'm active." The Dubliner, who says he will decide his next move during the Christmas period, added: "I know the option is there for the 155lb lightweight belt. "Maybe I feel there's a couple of contenders in the featherweight mix - let them compete against each other while I go up and take the lightweight belt, and then go back down and take out that contender. "Then I'll go back up after a lightweight contender has emerged and take them out." McGregor has been credited, along with former women's bantamweight champion Ronda Rousey, with widening the appeal of mixed martial arts. 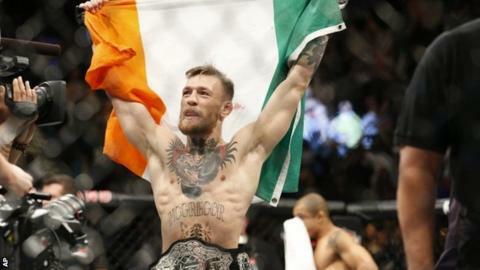 There were an estimated 10,000 Irish fans among the 16,516-strong attendance at the MGM Grand Garden Arena. "The Irish fans, you can't beat them. We're making this sport what it is today. They're doing us proud." McGregor had predicted he would beat Aldo in the first round in the build-up to the fight. "If you can see it here and you have the courage to speak it, it will happen. I knew he would overextend and I knew I'd catch him. Mystic Mc strikes again. "Jose has been a phenomenal champion. It would have been nice if the contest had stretched out a little longer, but I still feel the same process would have happened." McGregor had to lose weight to reach the 145lb cut-off for the featherweight title, and looked gaunt at the weigh-in before putting on weight for the fight the next day. "I always giggle. Every time on the scales, everyone says 'it's the worst I've ever seen him - he'd better rehydrate right or he's in a lot of trouble'. Don't get me wrong, it's a tough weight cut but tell me one time I've missed it or not shown up fresh the next day." He also repeated the fact he would love to fight in his home city of Dublin. "If they offer me Croke Park or the football stadium, you're damn right I'll take it." Brazilian Rafael dos Anjos, 31, defends his lightweight championship against 32-year-old American Donald Cerrone next weekend.